Although pounded earth floors were still common in rural vernacular houses until recent times, it is more usual to find slabs of stone, slate, marble and clay ‘quarry’ tiles laid on ground floors in halls, kitchens and sculleries. Boarded timber floors on joists were found in the more ‘important’ rooms and on the upper floors. Original tiled floors add great character to a building, but because they are often laid directly onto the earth, they can be damp and cold. The comfort level can be transformed and the appearance retained by lifting the tiles and re-laying them over a damp proof membrane and rigid insulation on a concrete screed. New and salvaged slate and quarry tiles are available. Laying old tiles may be more costly than putting down modern materials because, like many natural products they may be irregular in shape and thickness, but the quality and look of the finished floor should repay this extra effort. Quarry tiles, which are unglazed, need to be sealed after laying and cleaning to prevent them absorbing stains. The traditional method was to use linseed oil and wax polish. This will make the floor shine but is very labour intensive and a modern cold wax polish is a suitable alternative. Tiled floors should never be treated with any kind of polyurethane coating. This gives a completely inauthentic appearance and may cause the tiles to ‘sweat’ making for longterm problems by trapping moisture beneath the floor. 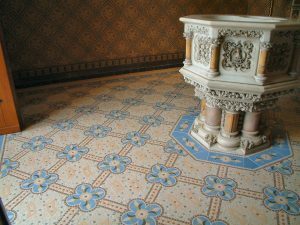 The Victorians were fond of small clay floor tiles, commonly laid in complex mosaic patterns, for front halls, hearths, garden paths and churches. They are durable and easy to maintain and should be retained wherever possible. Such geometric tiles are still being made. Wall tiles have a long history but Victorian mass production, especially for fireplaces ensured widespread popularity. 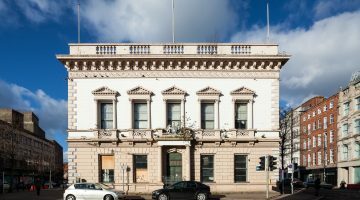 An enormous variety of mouldings and designs created interiors of some opulence in both private and commercial buildings. Wonderful Art Nouveau tiles with stylised plants became common in domestic interiors and new precise reproductions are available. Old tiles are often very firmly fixed and can easily be broken, so great care is needed when stripping an area for re-use. Rather than replace a large area of original tiles, it may be preferable to repair any broken or damaged ones in situ, clean them thoroughly but gently and re-grout. External tiles made of terracotta or ‘faience’ were frequently used during the late nineteenth and early twentieth centuries. This material is fragile and easily damaged by clumsy cleaning or repairs and specialist advice should be sought before starting work.